As bloggers, we want and in some cases need more eye balls on our content. But it’s not always so easy. And there’s a lot of bad advice around that could hurt your chances. You need insights from the experts. Today I have a real treat for you. I have assembled a group of incredible blogging, marketing and social media experts with the aim of giving a single piece of advice that could make a huge difference to your online presence. And, ultimately help you stand out and get more eyeballs on your content. If you could give one piece of advice to bloggers that would help them grow their online presence or just stand out online, what would it be? Click on the experts name to read their answer. Aaron Lee, Adrienne Smith, Ashley Faulkes, Brian Dean, Bonnie Andrews. Caleb Storkey, Charissa Moore, Chris Garrett, Christian Karasiewicz, Cyrus Shepard. Danny Iny, Danny Wong, Denise Wakeman, Devesh Sharma. Jeff Bullas, Jimmy Rodriguez, John Doherty, John Lee Dumas, John Paul Aguiar, Jon Morrow. Larry Kim, Laurie Hurley, Lisa Irby, Lyuba Ellingson. Martin Shervington, Michael Juba, Mike Allton. Wade Harman, Walter Blake Knoblock. Find your unique voice and be at peace with it. What do you get passionate about, what does your audience want and how can you make that passion contagious with your audience? With so many voices sharing great content, the one thing that people will never be able to trump you on, is you… being the incredible you that you are. With all your insecurities, doubts, fears, dreams, hopes, aspirations, strategies and insights! Let your unique voice capture your listeners heart, serve their needs and add tangible value to their lives…. and they’ll always keep coming back for more. ONLY publish case studies. Literally don’t publish anything that’s not a case study in some way. The fact is, unless you’re a huge name like Gary Vaynerchuk, no one cares what you think. But they DO care about how you can help them. One of the best ways to show people that you can help them is to publish case studies. But I’ve come to realize — after analyzing what content did best on my blog — that there’s really no reason NOT to publish a case study every single time. After all, if you have advice that’s helpful, you shouldn’t have a problem publishing a case study to go along with it. Big name bloggers like Pat Flynn came out of nowhere by ditching “here’s my take on X” content and focusing on case study content. It works. Connect with the emotions of your audience. If you can speak to what they’re feeling now, as well as how they want to feel, you’ll create a relationship with them they’ll never forget. It would be to guest post. A lot of bloggers try to build their brand and presence through their own blog, but why not leverage the traffic of large blogs? For example, it is rare that your blog will ever get more traffic than sites like Forbes, so in addition to posting on your blog, look to guest post on authoritative sites. Don’t do it for the backlinks, do it for the branding. Align yourself with other ambitious and influential bloggers. My career as a blogger has spanned nearly 5 years, and during that time, I’ve been published on The Huffington Post, The Next Web, Search Engine Journal, Entrepreneur, and ReadWrite. When you ally with more-established bloggers and many up-and-coming writers, you’ll quickly recognize the power of collaboration and networking. Keeping bloggers in your niche in-the-know about your work means you’ll always be top-of-mind with them whenever noteworthy opportunities come up. I have many writers to thank for helping me grow my career; three worth mentioning are Shane Snow of Contently who gave me the confidence to work with my first paying client, and Ritika Puri and Brian Honigman who frequently refer quality clients and projects my way. Admittedly, it hasn’t been that much of an uphill battle to build a name for myself. And that all came organically after developing critical relationships with writers who loved my work after I showed it to them. If you’re just starting out as a blogger and want to get noticed quickly, you need to make yourself visible every day. To make this happen, you’re going to have to include a variety of tactics, which could, at first, feel overwhelming. The secret is to make it a natural part of your day and to think of it as supporting one goal: visibility. Spend 20 to 30 minutes a day curating articles that relate to your area of expertise. Use a tool like Buffer or HootSuite to schedule them over the next day or so in Twitter. Get involved in some groups on LinkedIn and/or Google+. Spend a half hour or so each week engaging with these groups. Focus on helping others, not promoting yourself. Write guest blog posts for leading blogs in your industry. Set a goal of publishing at least one guest post per month. Don’t forget your own website. When people see you online, they’ll come to check you out. Make sure your site looks professional and shows off your skills. And make sure it’s optimized for search. At least once a week, post a valuable piece of content to your own blog. Then share it on all your social channels. One final tip: A great way to get your name on people’s radar is to write an interview post like this one. You’ll quickly expand your network and develop relationship with recognized experts. You are running the show – not your blog. You wear the pants. You’re in the driver’s seat. So often I see bloggers who are letting their blogs take over, like the blog is some kind of living, breathing life form that’s controlling them. They feel stressed. They feel frustrated. They feel overwhelmed and they feel like a master to their blog instead of their blog being a servant in their online/blogging business. It’s unreal how often bloggers want to give up, even when they’re onto something great. So in short, don’t give up and don’t let your blog become your master. Keep it in a real perspective and think straight. This is you. This is your business and no one can take it away from you or make you fail outside of your permission. Here are 5 more tips you’ll probably be interested in reading about too: 5 Simple Ways to Rock Your Blog and Have a Life Too. If I could give one piece of advice to bloggers that would help them grow their online presence it would be to leverage their social media channels. A lot of bloggers I work with think that once they have written their blog post, that’s it. If you are a blogger and you want to grow your online presence, you need to be sure you also promote your blog post after you hit publish. By taking this extra step, you can leverage your connections to get the word out about your latest blog post. It is also important to remember to include links to your social media channels where you want readers to connect with you at. This way once they read your content, if they want to connect, you have made it easy for them to. By promoting your blog post, not only can you increase your views, but build awareness on your knowledge on a particular topic and grow your online presence. If I could give one piece of advice to bloggers that would help them stand out online it would be to network with other bloggers (and write awesome content). One of the fastest ways to stand out online is to write content people want to read. But how do you do that if you have a limited audience? That’s where networking comes into play. By networking, not only can you get your content in front or more people, but if you network with the right people, you can gain more exposure just by having them mention you or share your content within their network of friends, fans and business associates. One of the best ways to do this is to guest blog for other sites. Some ways to do this are to use the contact form on a site you want to guest post for or to engage with them via their social media channels. By doing this, you can open doors and also demonstrate to people who are not familiar with your work that you are a subject matter expert on a particular topic. In doing this, you can not only get your name out there but stand out more in a crowded online world. I would say it comes down to two things. First, have a blog design that stands out and is different. If you visit enough blogs, they all start to look the same, same themes, same colors, it’s boring. Instead, use a design and color scheme that no one has, whether they like it or not, they will remember it. Second, I would say “write your content”. That means, write original stuff, write stuff no one is writing and in a way no one else is writing it. Curation is a big thing online now and I see many bloggers doing it, to me I think it’s a BIG mistake. Referencing someone or something in a post is fine, but full curation isn’t good. How can YOU stand out when you are mainly sharing OTHER peoples stuff? Write content in a way that ONLY you can write, once you do that it will be very easy for you to get noticed and grow your presence online. If you can find something you can help with, that is in demand, and is under-served, then you will not just stand out but you will make a significant contribution to other people’s lives. Now, don’t get me wrong, I do not mean find something where there is no competition! I mean get to know your specific target audience so you can help them the best. Let them connect with you, let your personality and voice come through. Use the benefit of your own experience while teaching. It’s about them, but use what makes you “you” to reach them. To give you an example, I am learning about the world of fiction writing from Sean Platt and Johnny Truant, even though there is a lot of information out there for aspiring authors. I feel they “get me” in regards my specific needs. Unlike other people who are giving storytelling advice, they are normal people who have discovered some effective systems, but they also have personality. They teach their readers to work hard, while they also demonstrably work very hard, and they tell their audience very clearly that “build it and they will come” is a mission bound to fail. So they meet a need, in their own unique way, with their tried and tested systems. Not everyone will resonate with them, and that is a good thing. A good way to start to develop an audience is to comment on more established blogs in your niche—but only when you can add something meaningful to the conversation. Most blogging platforms will let you identify your website when you’re commenting. If someone finds your comment of value, they will often click through to your site to find out more. The trick here is not to get promotional (such as adding a self-serving link to your articles in the comment) or saying something meaningless, such as “great post!” Look at it as a way to add value to the blogger’s post without stepping on toes. Perhaps you could pose another question or offer a different spin on the topic. Make it a regular practice to seek out blogs to comment on. I also like to comment often on industry blogs because they are widely read and many will see what you have to say, some even rate you as a commenter. Always keep this in mind… To me it is really simple, if you want to “stand out” in the social space, do what most others are not doing… actually be SOCIAL when using Social Media 🙂 #RonR #H2H. I think clarity is hugely important for bloggers. And for me there are two types: clarity of purpose and clarity of execution. Clarity of purpose means knowing exactly who you’re targeting with your blog, how you’re helping them and why your blog is different to all the other blogs out there. Too many bloggers don’t know the answers to these basic questions and as a result they find it hard to stand out from the crowd. Clarity of execution means bringing this purpose to life with your blog so that new visitors know within seconds whether or not it’s relevant to them, their needs and concerns. That clarity extends to your blog design, your tagline, your about page, your headlines – everything must resonate with your core purpose. And you must learn to write clearly too. You can’t spread great ideas if you can’t successfully plant the seed in someone else’s head (a topic I write about here). Standing out means that others are easily able to bring you and your blog into clear focus. And without clarity of purpose and execution you’ll remain a blur in the background forever. For me the single biggest difference has been guest posting. It’s all about creating relationships with others, showing your expertise and becoming an authority in your niche. When you have done some guest posting (also on bigger blogs), it makes it easier to launch your own product later on. This (creating products) will grow your audience and your authority even further. Be different than every other blogger out there. You can be different by picking a niche that no one else writes content on or deliver the content in a different way than someone else. My entire focus on my blog is social media tools. Although many people write about tools there was no one site that focussed only on tools. This helps your blog grow a lot quicker. If you don’t stand out from the crowd it will a steeper hill you have to climb. Make your blog about your audience, not about you. You don’t matter. If you want to be successful, you have to set your ego aside and focus entirely on building what your audience needs and wants. Write an entire blog post without using the word “I.” You can’t cheat by writing things like “One might think…” either. Instead, relate every single point you have to make to the audience. Make yourself invisible. Once you master the art of invisibility, you can start injecting your own colorful personality back into your posts. In the beginning though, make yourself as transparent as glass. Getting attention as a blogger today is tougher than a doorman at a London pub. That is to say, extremely tough and also quite a challenge. I have used a few techniques to help expand my reach and get myself known since I started blogging, and I am quickly going to share some of my secrets with you. One of the first things I did was to write something that included a lot of influencers in it. This is a trick that a lot of people will probably mention in this post, so I will move on to my next idea. Another great idea is to stand out from the crowd by branding yourself. In fact, quite recently I had a great podcast discussion with John Paul Agiuar on this very topic. He is a smart guy, so it is worth a listen. So what exactly do I mean by branding yourself? Find a unique color scheme and a font or two, and a logo of course, that suit your brand. Use these on all of your images for social media and blog posts. Use the same image of you (or your logo) on all your social media accounts, email, gravitar etc . Also add your blog URL to all images and videos on social media. If you want some great role models for this kind of thing (apart from myself of course) check out Rebekah Radice, Dustin Stout and Robert Ryan. These guys are doing a great job of personal branding online. Although this may seem like something that will not get you very far, remember that not many people are doing this, or doing this well. But if branding works for Coke, Nike and McDonalds, then it is certainly worth giving it a go! A final note: If you need some help making awesome images to promote your brand, a great tool to use is Canva. Start thinking seriously about your brand today and stand out from the crowd. In order to build your presence online and stand out from all the other noise, be sure you are consistently delivering great content every single time you blog. Addressing your clients’ needs, worries, and problems, while infusing a bit of your own personality is the perfect mixture for a stellar blog. Join a blogging group on LinkedIn or Google Plus so your blogs are seen by others and shared and commented on for increased exposure. Most importantly, tell a story – draw your readers in, don’t just list five tips for this or that; boring and it’s probably been done before. Really, it will renew your blogging experience. Not only does the content you create get indexed by Google, but the community on Google+ will actual enable your content to be amplified and help it surface as Search results. You can create mini opt in lists of dedicated readers using Google circles, and email them with your latest posts. You will also have incredible conversations, get new ideas and the more you give, the more your future will be shaped by the network you form. Trust me, it will transform your online life as a blogger. It isn’t just one thing, otherwise you won’t stand out. You need to do at least two things! First create the best content you can that adds value to your readers lives and business. Then you need to build and optimize online distribution networks for your content including email, social and search. “Me-too” content is not going to cut it. If you search on this query in Google: intitle:”how to make french toast” you get more than 30,000 results in Google. That means that there are more than 30,000 web pages with “how to make French toast” in the title tag. Google does not need any more such articles. Neither do the audiences you are trying to reach on social media or the web at large. Find ways to create fantastic new content. If you need to cover a me-too like topic, find a way to bring a new spin to it, add some new humor to it, share it on a new platform, or address one specific vertical aspect of it in a way that others have not done before. Differentiation is critical to survival … and thriving on line. One thing that I would always recommend to people is to start searching for like-minded people right away. Build your tribe by connecting yourself to people that are in your target market. You cannot make it to the top by yourself; it’s the people around you that will help you get there, and you helping them. This is not an individual quest for victory its locking arms with the people you have made relationships with and helping each other succeed. You can do this by helping promote other people’s posts and events, retweeting and re-sharing. People remember that. People also remember someone who extends kindness and helpfulness without expecting anything in return. Do what you can to be a servant so you can eventually be served yourself. There are a lot of different things that bloggers can do to stand out online – but the first and most important one is to focus on one niche. When you dilute your message by writing about different subjects in different areas, your reader’s don’t know what to think. This is okay later on after you’ve built a reputation and have strong relationships with your readership and the broader community – but in the beginning people need to know what to expect from you, and by narrowly focusing on one specific niche you can build yourself into a position of authority much more quickly. Pick something you’re good at, that interests you, and that you have good reason to believe will interest a lot of other people as well. I have two pieces of advice to bloggers to help them grow their presence and stand out online. 1. The first would be to create something unique and useful that no one in their space has done before. For example, I am a bicyclist and although there are bicycling route sites aplenty online, they are confusing and hard to navigate, so I might create the Most Amazing Bicycle Routes in Seattle and rank them by difficulty, elevation, length, popularity, etc. It’s usually not very hard to find something to create that’s better than everything else out there – the hard part is actually putting in the work to make it. 2. Getting involved with other bloggers, being social, is an essential part of the equation. Bloggers and people who comment on your blog are people themselves who like to engage, and these are the very same people you want to promote your work. If you are a finance blogger, help out other finance bloggers! Leave comments, link to their posts, say hi to them at conferences. Blogging is a lot like real life, except when you do it right you can connect with people in the world even when you are sleeping. Build a blog with a memorable design. Choose your style and colors, and be consistent with it. Be creative with your content formatting but make sure they’re easy on the eyes. Use unique and captivating images. If you use stock photos, at least make an effort to spruce them up. Be passionate about your subject. Be specific. Be personal. Share examples, your experiences or your own story. Offer something fresh. Don’t just post what everyone else is posting. My best piece of advice that has worked extremely well for me is to leave genuine, thoughtful and helpful comments on other people’s posts. Trust me when I say they’ll notice you. I know people say this all the time to not get in a hurry and leave short comments but to actually take the time to read their posts and leave a very well thought out comment. They give that advice for a reason. It’s the best way to get noticed by others and then of course be sure to share their posts on the social media sites. I’ve had more people approach me because they have read my comments and were very impressed that I really took the time to leave good ones on every post I visit. I still believe commenting is a great way to build relationships with other bloggers and I’ve had a lot of success with that. That’s a great question – however I don’t believe there are any silver bullets. For me, it all comes down to being consistent, growing your online presence takes time, patience and lots of hard work. Figure out your niche, create and promote great content, identify influencers and build your network. Learn and repeat. From what I’ve seen, many give up before they get there, while a few stick at it long enough to ultimately learn how to really stand out. One of the most important pieces of advice I can give someone about growing their online presence or simply stand out is to choose a niche or topic that they simply LOVE and is timeless. They should treat blogging like a serious business instead of a ‘money magnet’. Many times, people start a blog because it’s a ‘good market’ and while building the blog, they feel burned out because they simply don’t have the passion and the drive to write for that topic. Blogging is a career and if you want to stand out, it has to be something that you love writing and love to share. That is how you can truly stand out and most important be yourself. There is a big debate about shutting down blog comments. Copyblogger did it. Mitch Joel did it. Jay Baer is considering it. The common thing, you’ll notice, is they are all well-established bloggers with lots of readers and subscribers. When you begin, though, no one knows about you, which makes a community extremely important. Not only will a community read and share your content, they’ll help you grow your network. To do that, you want to respond to people when they do comment on your blog. You want to find other bloggers with like-minded content and go comment on and share their content. Write guest posts for blogs that have a similar audience to the one you want to grow. All of these things take time, resources, and a little elbow grease. But building a community will be one of the most important things you do to grow your online presence. You’ll obtain new social media followers, you’ll discover new thinking, and you’ll grow your readers and subscribers. In order to stand out online, having a constant presence on it is a must. And the perfect way to start-off your journey to success is by building friendships with individuals who love writing as much as you do: bloggers. Identifying and outreaching prominent bloggers in their niche, and regularly posting comments on their websites, can help you out tremendously. After a while of them constantly reading your comments and you analyzing the type of content they usually post, you can reach out to those bloggers and show them your content and invite them to post it in their online channels. Bloggers are great influencers that every writer should try to obtain. Once they read your work and like it, you’ll more than likely be contacted often by them to write more blog content, which will be of great benefit for you. Once you have that constant Internet presence, you’ll stand-out and make a name for yourself! Don’t ever forget about your friends once you start working with well-known individuals, as your pals will always be the ones by your side not matter what (even if you write a mediocre article). They’ll always support you and assist you in spreading your message! Be authentic, and not just with your triumphs, your failures too. People just want to know there’s a human behind the site. The more transparent you are, the more your audience will connect with you. The Web is not just about websites with content, but the personality of the people connected to them. I think many bloggers hit publish and wait for traffic to magically appear. This isn’t going to happen. You need to actively promote your content via social networks and being active on social media. Social media + blogging + working hard = the “magic” to blog traffic. To accelerate visibility for your blog, start a Hangout on Air show around the topic of your business blog. Doing a live video show is the fastest way to get seen, be heard, build trust and connect with your ideal blog readers. 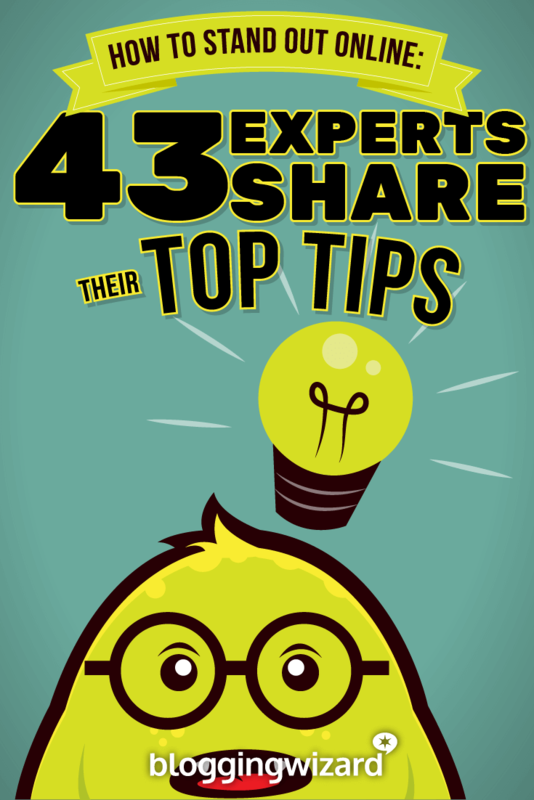 Focus on your primary topic and invite guest experts who complement your expertise. You will set yourself apart fast by adding a playlist of your videos on YouTube and repurposing the audio on a site like SoundCloud and iTunes. Always include a call to action for your audience to subscribe to get blog updates at the beginning and end of your show. My single best advice to new bloggers who want to succeed would be to become regular readers of as many other bloggers in their space as they can, and look for opportunities to create genuine relationships with those writers. These are the people whom you can learn from, who will be providing valuable information that you can then share to your own growing follower base, and whom it will mean the world to you when they notice you and begin to share some of your content out to their followers. If I could only give one piece of advice to a blogger trying to go big and get out there it would be to make something freaking awesome that answers a question in your industry, or that people in your niche are searching for. This gives you trust and authority and they will surely follow you the next time they are looking for information in your industry. For example, we work with a client who sells arcade games. Not the biggest player out there, just a local guy with a few hundred arcade systems. The other week we created an animated gifographic on the evolution of arcade games and it went pretty big on the first day I put it out there. It got on the home page of Wired and Make Use Of, among a bunch of gaming sites. So now all of these gamers that had no idea who M&P was now know who they are. Here’s the post on Wired. Develop relationships online with people who are already famous with your target demographic but don’t do what you do. Offer them something very helpful like guest content on a topic their audience is interested in and you are an expert on. Make sure to provide a lot of value. Go above and beyond. Once the guest post goes live, be sure to thank your new acquaintance for the opportunity and express interest in doing more. There is no better and quicker way to stand out online than to be promoted with someone with influence. I’ve got over 100k followers, most of them on twitter, and I think a large reason for that is engagement, but everybody says that and, of course, if you engage with your followers and say smart stuff it will work. But, beyond that, I make sure that whenever I do something noteworthy, speaking at a college, publishing a new book, etc…, I put out the word to everybody I know. A good PR list is gold. You can find some great success in growing your online presence and blog with Pinterest when you create an amazing feature visual with a great headline in it, similar to a magazine cover. By producing featured visuals that are beautiful and “pinnable” on your blog you can receive hundreds, and even thousands of more shares. But you have to create something that pinners on Pinterest can pin. The main challenge that some blogs don’t incorporate a Pin it button on their website to help encourage the spread of their blog content on Pinterest, even though it may have a great feature visual. Pinterest isn’t just a visual tool for sharing, many marketers and bloggers also use it as a book marking tool so that they can reference and read the material later on. I wrote a piece about how to search optimize your pins on Pinterest. People find it on my blog, and then pin it and then later on, other people repin it, and somehow it resurfaces again on another pinner’s account weeks later. The interesting thing is that a pin has a half-life that’s thousands of times longer than a Facebook status or tweet, according to Venturebeat. By being able to put a pin it button, and create an amazing visual that’s relevant to my specific audience, which is marketers and small businesses, my pin that promotes Pinterest search optimization has been repinned over 450 times. This is the power of Pinterest for helping you grow your online presence. Get involved. Join conversations, start conversations. Growing your online presence requires you to not only put out great content, but to also connect and engage post publish. Joining the community establishes influence and credibility, key to growing your online presence. Try enlisting the help of other influential folks. There’s a few ways to do this. For example, you can take an interest in their content by commenting and reposting the content that they share, and even try meeting them in real life at industry conferences. Another approach is to create amazing content that will get the attention of influencers, since they’re always on the lookout for awesome stuff to share with their audiences. Connect with other bloggers in your niche. If you want to grow your online presence, than you need to start building connections with other bloggers in your niche. This is how I built relationship with Adam Connell; I first dropped him an email and asked if he could link to one of my blog posts in his next weekly roundup. He not only linked to my post but also did a few guest posts. Since then he has featured me on his blog quite a few times (Thanks Adam). The trick to growing your audience online is actually counterintuitive from what you might expect. The commonly slung around tricks, tactics and strategies which prey on the law of large numbers are yielding lower and lower returns. Today’s Connected Generation consumer wants a human relationship with the brands they do business with and relationships start with trust. My one piece of advice to bloggers looking to grow their online presence is value the trust built between you and your audience above all else. No matter what industry, topic, niche blog about, focus on authenticity, transparency and honesty. All of which lead to trust. This may come across as being a little cheesy, but I think the best advice I can give to any aspiring blogger is to Be Yourself. I see many bloggers saying something is amazing just to get an affiliate commission, whether they have used it or not. I also see many people simply mimicking others because they feel that it will get them readers. If you want to set yourself apart from the crowd, be yourself. If you do not like something, say so. If you love something even when everyone else hates it, do not be afraid to say you love it and explain why. At the end of the day, you want to have a unique voice and not follow the herd in order to be accepted. Some people will love you for it, some people will hate you for it, though at least you will be unique. Blogging is something you should be passionate about. That is why I encourage all bloggers to speak up and share their opinion rather than conforming to the opinions of others because they feel they should. Find blogs that have a large subscriber base and accept guest posts. Build a list of the ones that are a good match for your expertise, research their current content and develop a list of topics that would be a good fit for their audience. Reach out offering your articles as a guest writer, provide references for the quality of your work as a link to existing articles on your own blog. Guest blogging will help you establish yourself as an authority, and followers of these blogs like your articles, they will organically approach your blog looking for additional content. Land high-quality links with the help of HARO. Links acquired from top-notch industry sites are always beneficial for your business. Besides an SEO value that those links bring to your site, they also help to grow your brand awareness and trustworthiness. However, not each and every business can afford to hire an SEO agency to make things happen. And that’s where HARO comes in. HARO connects experts across various industries and journalists to create really engaging news stories that will be published on the very best sites in your niche. Register on the HARO site and sign up to relevant to your business streams of queries that will be sent 3 times per day directly in your inbox. Review HARO journalist’s source requests and pick up those that are relevant to your expertise. Craft your perfect pitch that will include a quick summary of your response structured with 3-5 bullet points. You can also subscribe to streams that aren’t relevant to your current business but still relevant to your expertise and send your answers to them as well. In that case, you’re doubling your chances to generate more links from media outlets. Phew. We’ve shared a lot of advice with you today. Now, it’s time to start implementing what you’ve learned. The best way to proceed is to pick out the answer that resonates with you the most, and start experimenting. Be sure to bookmark this so you can come back to it and work through the advice in other answers. Finally, I’d like to say a huge thank you for all of the experts above that took the time to take part.